One of the first website developments we did, and the project that got us going on the path of developing solutions on a wordpress platform. Through the work on iPodRepublic.com i have made valuable learnings in terms of driving organic traffic from search engines, trying to optimize the site for search listings, and creating content that people find valuable. 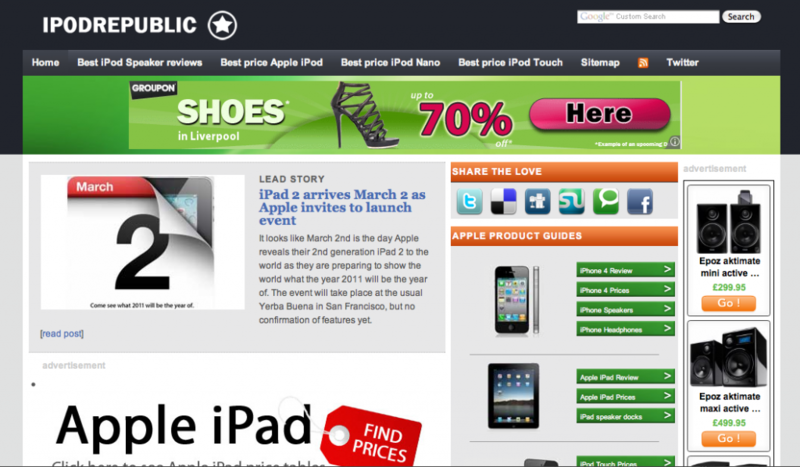 iPodRepublic.com is ment to be a resource for owners of gadgets like the iPhone, iPad, and iPod, delivering the latest news and rumors from the world of Apple as well as providing insight and reviews into the accessory market. You might be thinking that Apple and Android can never go along, and attempts to transfer data from Android to Mac will be doomed to failure. You are right insofar as the claims are concerned, in reality, both devices can co-exist together. Amazon has announced that their music streaming service has just gotten better. Prime Music is over a million songs and hundreds of hand‑built playlists, with ad‑free listening anywhere, on any device, anytime with Amazon Prime. To celebrate this and get more users signed up they are holding a £25,000 prize draw. The countdown has begun to Black Friday which takes place on the 27th november this year. But we are already seeing several online retailers (and some brick and mortar one's as well) kickstarting it very early, turning the week leading up to Black Friday into sort of a Black-ish Friday. Picking a compact wireless speaker with both DAB and FM radio these days is not easy, as there's plenty to choose from. A new one throwing its hat in the ring is the KitSound Air Audio DAB/FM/Bluetooth Radio Speaker, a serious contender with its affordable price point, sleek looks, and good performance. As the UK summer is drawing to an end once again, there's still, hopefully, a good month or so left of being able to enjoy the outdoor, having a BBQ, and listening to music. The Kitsound Hive Discovery provides the flexibility of wireless music on the go, as well as waterproof should those late summer showers take you by surprise.